I felt some trepidation reading this book, for exactly the same reasons the author stated that she was hesitant to write it. The memories of that day are still so raw - it was a very scary time. And yet, I see kids clamor for the other books in this series; The Sinking of the Titanic, 1912 and The San Francisco Earthquake, 1906 are especially popular titles. For children who weren't even born when September 11th happened, it's just another historic event they are curious about. Lucas is disappointed in being pulled from his middle school football team due to an injury. He decides to take the train into New York City to see if his beloved uncle Benny can talk his parents into changing their minds. 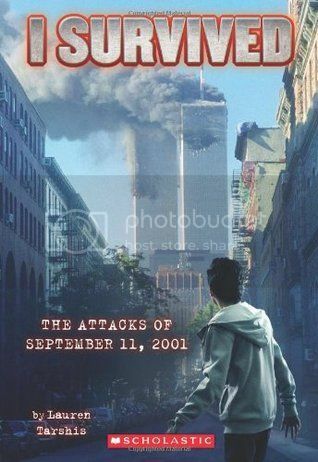 Lucas soon finds himself in the midst of disaster, as the first plane hits the World Trade Center tower, and his uncle and dad, both firefighters, are called to help out. Most of the truly grim details of the terrorist attack are glossed over, but the sense of panic and alarm in those initial moments is handled in a very sensitive and age-appropriate way. The afterward from the author goes into more detail, explaining the number of casualties, and the national and world-wide reaction after the attacks. I was glad that she decided not to kill off Uncle Benny - even though it might have made the story more dramatic, the series is called "I Survived," after all. Informative and fast-paced, this is a good choice for third-grade readers who want to know more about this day in history.